If you're thinking about multiplying the church, there are four different avenues you can take. 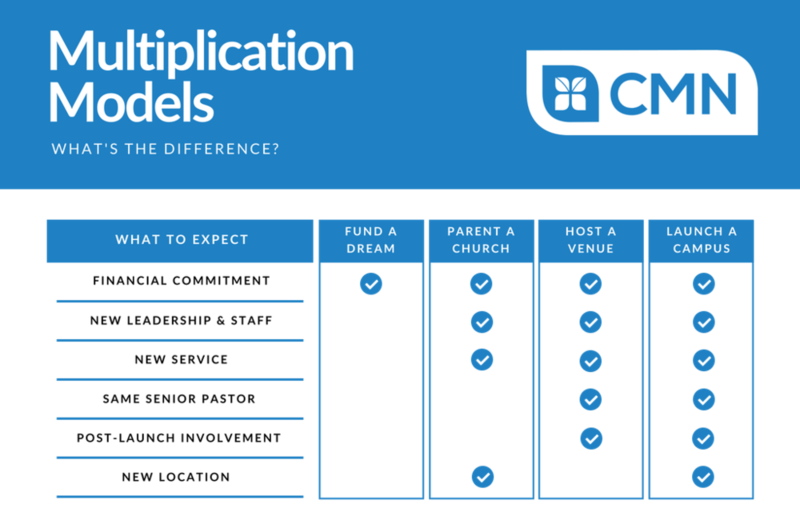 Watch the videos below to learn more about each model of multiplication. Launching a campus multiplies the presence of a church in a city. A new campus replicates the DNA of the launching church and functions as one church in multiple locations. Hosting a venue multiplies opportunities to reach a single setting for the gospel. A venue typically meets at the home campus as a new service dedicated to reaching a special population – such as a new service in a different language. Funding a dream multiplies churches by providing critical financial resources for church planters. CMN stewards a matching fund that disburses up to $50,000 to a church plant in the process of pre-launch fundraising. By donating to this cause you can play a critical part in church multiplication. What kind of multiplier are you? Now that you've learned about the different types of multiplication, it's time to discover what kind of multiplier you are. Take this 2-minute quiz to get started! Place - Where will it happen? People - Who will do this with you? Provision - What will it cost? Problems - What barriers exist? Process - What process will you take?